Loaded potash train B786 motors south past the Chittamo siding on CN's Superior Subdivision. 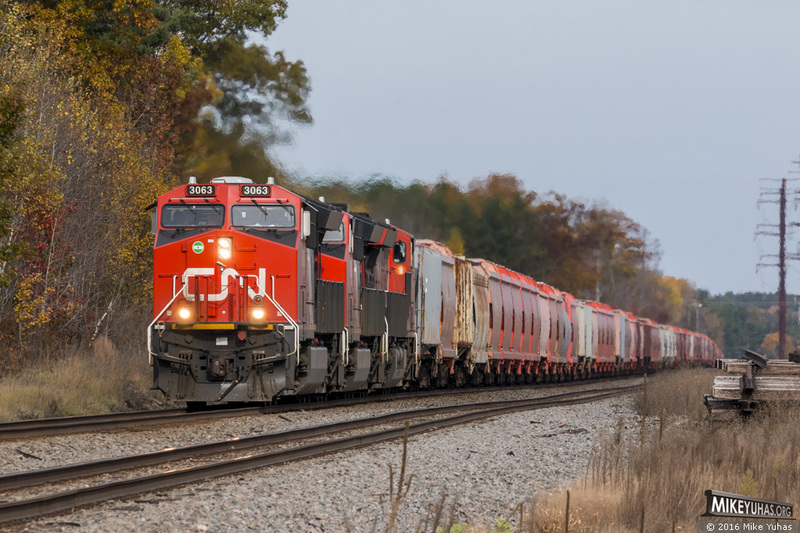 Train details: CN ET44ACs 3063, 3009 & 3061; 105 loads and 0 empties; 13,756 tons, 5,651 feet. According to several internet sources, an adequate intake of potassium, the elemental form of potash, is widely regarded to be about 4,700 mg per day for adults, or about 0.165788 ounces. That works out to about 6.0318 daily servings of potassium per ounce, or about 96.51 servings per pound, or about 197,018 servings per ton. Each of these covered hoppers has a lading capacity of about 229,000 pounds, so each carload represents about 22,100,513 servings of potassium. The trainload would provide a day's adequate potassium intake for 2,320,553,960 people. Somebody check my math, okay?